Encouraging the noble ideas of Chivalry; maintaining the monuments, archives, and history of the Knights Templar. Please click on the link and watch the introduction. Notice the Knights are claiming to be "Defending the Unjustly Accused and Protecting Freedom of Speech" How does Don Allen Holbrook exemplify any of their tenets??? I ask the members of this fine organization to look into this rogue member and strip him of his knighthood for his nefarious activities. He has repeatedly threatend American taxpayers for speaking out about matters of public concern and now has sued them all as John and Jane Does as third-party defendants in his suit with Huber Heights, Ohio. He has lived very high on the taxpayers dime and it is time for some answers! Last edited by Soapboxmom; 06-04-2018 at 09:14 AM. Don Allen Hobrook LLC has sued The Tribune, Cynthia Calvert, The Houston Press, Craig Malisow, The Pahrump Valley Times, John and Jane Does that have commented on matters of public concern and me (Soapboxmom). All of us have been unjustly accused. Will the fine Knights defend us against their rogue member? Will the knights fight to protect freedom of speech? Will Don Holbrook's new mantra that none shall post be condemned or held out as the work of the Lord? And, none shall post, says Don Holbrook the self-proclaimed Lord of the internet. Will the knights defend the lowly peasants Holbrook is targeting??? a. Court of Honour. The Court of Honour treats, in an autonomous manner, all questions of honour within the Order. The Court of Honour shall be convened at the order of the Grand Prior or upon the written request of five Grand Officers. The Grand Chancellor shall be the presiding officer. The Grand Avocat shall be the prosecutor and the respondent may select the respondents own counsel from among the Grand Officers. This was when I was knighted at West Point USMA in June of 2010 by the Sovereign Military Order of the Temple of Jerusalem, the Knights Templar. Tracy Watkins Barber likes this. Paul Osterhout We're Knights of the Round Table. Unbelievable that this threatening goon who lives high on the hog on the taxpayers dollars was actually knighted. His fellow knights must be outraged by his attacks on free speech and unjust accusations brought to court in order to silence the taxpayers of America. Nothing like more negative publicity. With this, Chris Brown wanting yet another market research study and the new board likely to be much more fiscally responsible, I don't think Earthquest will be roaring into EMC. Notice Holbrook's fellow knights work up to 30 hours a week for their charitable organization without any compensation whatsoever (look at all the zeroes on the IRS filing below) when Holbrook himself charged a ridiculous $185.00 an hour to the Earthquest Institute that is now defunct without having done any charitable work to speak of. That organization under his leadership spent around 1.4 million dollars and apparently got 1.1 million in tax dollars from the East Montgomery County Improvement District. Holbrook pocketed $328,000.00. That certainly is not the work of a man of God in my book. I am writing to all the groups and sharing the story of their Black Knight, Don Allen Holbrook. Thank you for your interest in the Sovereign Military Order of the Temple of Jerusalem (SMOTJ). 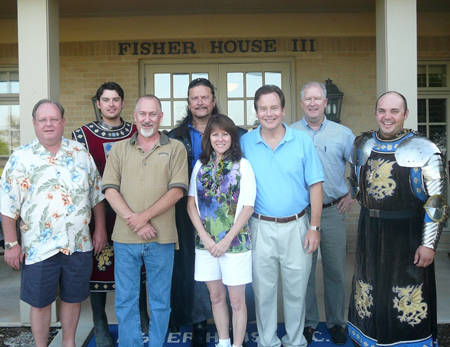 As indicated on our public web page, we are a charitable order of Christian men and women that seek to continue the traditions of the Order of the "Poor Knights of the Temple," which was established in the Holy Land in 1128 AD, through more modern spiritual, ethical and moral crusades that help those in need. Membership in SMOTJ is by invitation only. It is granted only to those who have demonstrated through their accomplishments and their continued willingness to serve in a variety of endeavors that they have the highest ethical and moral principles and personal integrity. 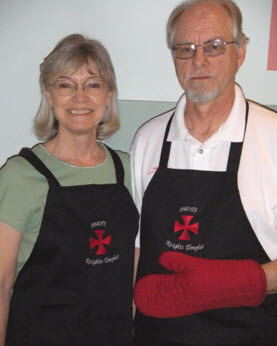 Although there is no "typical" Templar, all Knights and Dames of the Order are Christian. Most are college graduates (many with advanced degrees). Many are accomplished leaders in their fields, have served in the Armed Forces, and are engaged in a wide variety of civic endeavors. Most also have a strong interest in the history of the Knights Templar, and all wish to actively contribute their personal efforts to make our society and the world at large a better place. Given this information, if you are interested in being considered for membership, I encourage you to send me a letter of introduction, explaining fully your interest in SMOTJ. The letter should be accompanied by a comprehensive resume noting your full name, address, phone numbers and relevant qualifications. They should be sent to me at the E-mail address noted above, so that our leadership may evaluate them fully. If your interests and those of the Order's leadership match, we will forward your information to the Prior or Commander in closest proximity to your location, and that individual (or designee) will contact you directly to explore further your potential for membership. We will protect the information you provide fully, and will not use it for any other purpose. The evaluation process will quite naturally take some time; I would ask that you please be patient in awaiting a response. As you can imagine, we receive numerous queries, and must exercise care and diligence in evaluating potential applicants. It seems obvious to me that knighting Don Holbrook was a tragic mistake and egregious error. Hopefully, the organization will take the decisive action necessary and revoke his membership in light of his misrepresentations to clients and vicious attacks on taxpayers (lawsuit) in an effort to silence discussions on matters of public concern. Holbrook has not demonstrated those qualities espoused in that response in the least. Could You Be a Knight Today? In this hectic world we live in how many of you have thought about the virtues and convictions of being a Knight? It would mean looking at all situations from a different perspective. A perspective of service to others, intolerance for injustice and standing against inequities even if the crowd doesn’t. How many of you could make such a living conviction today I wonder? How you handle adversity is the mark of your character. Some place great verbal strength in their convictions but when challenged to live those conviction and stand for their stated values and live within their moral compass, they shirk their duties and hide in the shadows hoping others did not see them in the crowd. This is not the mark of a true Knight. Yet, I believe that we can and should live our lives with the conviction of being a Knight. Someone others look to for strength and resolve and confidence that they will do what is right even at their own peril. Most cannot live up to that standard when their valor and honor is put to the true test of unintended consequences and unforeseen problems that might cause them economic or social status harm. It would be a far better place if we could find a few Knights and Dames that would lead us during these troublesome times. Do the things required to fix some of the wrongs and short circuited decisions that have been made that have created an oppressive economic and socially stranded future for some many. Knights are not about hand outs they are about empowering others to do for themselves and know that those that oppress us will be met on the field by those that will not tolerate such tyrants. Today our social and government system has created an environment that has lawfully allowed our capabilities to be diminished and our voice to be squelched. It is time for a few Knights and Dames to stand up for chivalric based values. I am so tired of our moral compass being whatever is best for someone rather than giving them the advice to live by their decisions and stand for their convictions and commitments. Knights were taught to be selfless in their stand against injustice and oppression to the point of their own peril and many times death in battle. How many of us would take such stands today if our own lives lay in the balance? I am not talking about being a soldier but rather standing for something that may isolate or make you unpopular. I hope you will at least consider this topic and decide to take action and stand for chivalric values and get a moral backbone instead of going along with whatever is popular. The Knights need to revoke his membership. This sick, litigious goon needs to be stopped. This lying ******* has sued numerous parties who have done nothing but seek and share the truth. Holbrook has been living off of the East Montgomery County Improvement Districts tax dollars and Earthquest Institute charity donors since 2007. He is the one oppressing freedom of speech. He is the sick tyrant trying to be Lord and master of the internet while the poor huddled masses have seen 1.2 million dollars paid to this guy for the Earthquest related activities alone from 2007-2010. It is high time his fellow Knights and Dames take decisive action against this most dark of Knights that is sullying their good name. For some time now I have been debating on whether or not to put together a tour of the significant historical places that I find have a Templar history either direct or indirect to the past and possibly even present day Templar influences. This would be a tour of Europe and the Holy Land for the most part. While I did the research on the Knights Templars for my two fictional books, “The Theoretical History of the Knights Templar Post 1307″ due out later this year and the fiction thriller adventure novel, “The 9th Templar,” I found so many interesting facts and legends woven into the fabric of the Templar lore. It made me start to wonder if setting up a series of at least planned tour circuit to explore these possibilities would be of interest to others? I began to explore where I would start the tour and where we would end the tour. I believe the Tour should start in Jerusalem because that is where the Templars were given their birthright by King Baldwin and later the Pope to commence their mission. It would of course include the Battle of Hattin and the major citidals of Acre and other Templar strongholds in the region. Next it would hop to Cyprus, where the Templars were gifted the island from King Richard and it was later their base of operations when they were driven from the holy land by the Saracens. From here we would stop in Turkey to visit Constantinople and the ancient city where some believe the Templars acquired some of their additional secrets when the Crusaders sacked it during the 4th Crusade. Next we go to Venice, the home of many of the Templar trading, commerce and shipping interests. From here we travel to Switzerland to see where some believe the Templars went to form their new community and then a country based on their own belief systems and things they held important such as secrecy and banking. We will travel by train through Austria and the Swiss mountain passes to the oldest democracy on the earth, Switzerland. Many believe it was the Templar influence that created the idea for a mandatory army of everyone to be well-trained to defend against invaders. This led to the defeat of the Austrian King Leopold in 1314 by peasants against his well-organized and heavily armed army of professional soldiers at the battle of Mortgarten. We will visit Sion to see where many think much Templar influence may have settled. Then onto Geneva to see the Templar influence on banking. From here we travel to the South of France. Then on around to the Cathar region where the Templars had strongholds surrounding Chateau Rennes les Chateau the village of many mysteries. Then to Avignon where the French Pope sold out the Templars (Clement V). We will depart France and cross the Pyrenees Mountains to Spain and Portugal to see where the Templars took refuge and reformed after the 1307 arrests. This calls for visits around Segovia Spain, Almoural Castle, and other Templar castles and then on to Portugal to see Tomar and the bustling City of Lisbon. From here we would head North again to France to the birthplace of many of the Templar founders. We would visit several Templar strongholds and cathedrals near Paris, including Notre Dame, the original site of the Temple of Paris and the site of the burning of Jacques de Molay in Paris and then onto La Rochelle, where the Templar Fleet was said to have sailed from with the treasury, secret relics, and ancient mysteries. From here we travel to Mont St. Michel the monastery that some believe the Templar fleet stopped and took refuge at while preparing for the remainder of their trips north to Scotland and the Baltic regions. We will turn and cross to Champagne to see the region where Sir Hugh de Payens was from and the Count of Champagne, who it is believed financed the original expedition to the Holy Land under the guise of the first crusade to discover great secrets, knowledge and wealth, which he intended to use to build his power base. But as we know the laws of unintended consequences could have played a major role in changing the course of the Count’s original plan for Sir Hugh and his men in his service. From here we will travel to London to see the English influence at the Temple Church and other castles around the region known to be related to the Templars. We travel north to Herefordshire to see the Royston Cave and onto Scotland to tour Edinburgh and Rosslyn Chapel and the original Rosslyn Castle ruins. From here we jump over to Denmark and take a ferry out to Bornholm island, where the Templars had a major fortification in the Baltic to protect their northern interests and act as a secure staging area. We return to Holland to discover the interests in Amsterdam that the Templars had on the concept of the stock market and concept of corporations. From here we return to Paris for food and fun and a jet ride back to the States. Now if this type of tour sounds of interest to you. Then let me know and we will begin to include you in further communications about forming this tour and getting group costs at as deep of discounts as possible. We will begin to plan and formulate ideas of other places we should visit as part of this tour. If you have ideas please let me know. I hope taking a historical tour like this is as exciting to you as it is to me. It could be the trip of a lifetime. This sick ******* declared chapter 7 bankruptcy in 2007 and it was discharged in 2010. During that time his LLC made 1.2 million dollars +. While his creditors ate almost 2 million dollars and a law firm alone ate 1.29 million in losses due to this creep, he was touring Europe and paying for The Meadows private school which costs 20 grand a year for his son. He declared bankruptcy again in 2011. This time he is in chapter 11 bankruptcy. When he has declred he cannot possibly pay his creditors what he owes them, how is it he can fund his extravagant world tours??? He was sued by Huber Heights, Ohio for a report they say is substandard to put it in a nut shell. Don Allen Holbrrok LLC proceeded to drag The Tribune, Cynthia Calvert, The Houston Press, Craig Malisow, The Pahrump Valley Times, Frank Maurizio, John and Jane Does (taxpayers commenting on matters of public concern using tax dollars) and me into this lawsuit as third-party defendants. His lawsuit is a lie-filled rant that is designed to frighten us all into silence. It is nothing more than a frivolous harassment suit. The Knights and Dames need to address this outrage. Now, the bankrupt, lying buffoon wants to embark on a world tour while his creditors and innocent detractors lose together hundreds of thousands of dollars because of this guy. Think of the hundreds of thousands in fees his legal adventures could generate. I will forward this to the Department of Justice. That world tour money he has squirreled away should go to his creditors and the attorney fees of those he has sued for seeking and sharing the truth. Question: "Should a Christian declare bankruptcy?" Answer: Although the Bible does not address bankruptcy per se, we do have some principles that might apply and therefore help us make some judgments. Biblical principle #1. We have the responsibility to keep our promises and pay what we owe. Ecclesiastes 5:4-5 says, “When you make a vow to God, do not delay to pay it; For He has no pleasure in fools. Pay what you have vowed — Better not to vow than to vow and not pay." Is it proper for a Christian in debt to get a “quick fix” to his problem by seeking bankruptcy? Based on these verses, the answer is “No.” A Christian is obligated to pay what he has agreed to pay, under the original terms of the agreement. It may mean a change of lifestyle and a radical revision of the budget, but the good stewardship of money is a part of godly living. Winchester, California (CNN) -- California authorities are taking a controversial veterans' charity to court, accusing it of paying officers "excessive" salaries and making "imprudent" loans, totaling hundreds of thousands of dollars, to a leading conservative activist's company. In a civil lawsuit announced Thursday, the state attorney general's office asked a judge to remove the president and the entire board of directors of Help Hospitalized Veterans. The complaint asks for the board and president to pay more than $4 million in penalties to compensate for "misrepresentations" in solicitations by the charity. The charity "has helped some veterans," Attorney General Kamala Harris told CNN's "Anderson Cooper 360." But she said nearly two-thirds of its revenue went to overhead, and the officers named in the complaint "have basically been lining their pockets off the compassion that Americans have for our veterans and servicemen and women." "They have really tugged, I think, at the heartstrings of Americans who want to help our veterans," Harris said. "And, instead, they've had gulf club memberships and condominiums, and they've been lining their pockets -- their personal pockets." The complaint accuses the charity -- which reported more than $31 million in donations in 2010 -- of making false statements on its tax filings, paying "excessive" compensation, using donors' funds to buy a country club membership and a suburban Washington condominium, and unlawfully diverting money to start another nonprofit. Its former president, Roger Chapin, was paid more than $2.3 million from 2002 and 2009, the complaint states, while Michael Lynch, the group's current president, has been paid more than $900,000 -- nearly $390,000 in 2010 alone, according to HHV's public tax disclosure forms. And the state accuses the nonprofit of making $800,000 in loans to the direct-mail company owned by Richard Viguerie, one of the founders of the modern conservative movement and a friend of Chapin's. According to tax filings, HHV uses Viguerie's company, Virginia-based American Target Advertising, as its principal fund-raiser. The California lawsuit calls the loans "imprudent and insecure" and states that ATA has never paid back all of the loans. The lawsuit was filed late Wednesday in Riverside County, outside Los Angeles. Thursday, in a statement read to CNN, Lynch said the charity hopes "these unproven allegations will not diminish the more than 40 years of service HHV has provided to our nations most valuable treasure, our veterans." "HHV looks forward to the chance to tell its story, and we hope this action will not impede its ability to add its support to hospitalized veterans nationwide," he said. Viguerie's company said would have "no statement at this time" on the allegations. The attorney general's office says it will distribute any judgment against HHV to state programs that aid veterans. 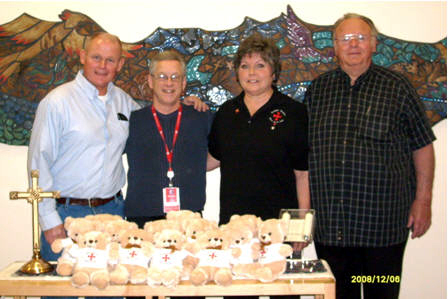 The charity was the focus of a contentious 2008 hearing by the House Committee on Oversight and Investigations. The groups's former president, Roger Chapin, was found to have purchased a condominium in Virginia with donated funds and received $1.96 million in pension payments from HHV, according to committee lawyers. In its complaint, the California attorney general's office cites that payment among a long list of abuses it says HHV has committed over recent years. The state lawsuit also accuses Chapin of using $500,000 from Help Hospitalized Veterans to start another charity, called Conquer Cancer and Alzheimer's Now. The complaint says Chapin was also president of that charity and that the half-million used to start it was "an unlawful diversion of HHV's assets, because it was not in furtherance of HHV's charitable purpose." As far as I'm concerned, they ought to be put in jail. According to its website and tax filings, HHV says its main mission is the distribution of "arts and craft kits" to patients at the nation's 155 Veterans Administration hospitals. The kits are designed to help rehabilitation efforts, and the charity values the kits it has distributed at $8 million a year. A VA spokesman confirmed to CNN that the kits are given out at 152 of the agency's hospitals. In a written statement, the Department of Veterans Affairs said it expects every organization that works with the agency "follows proper procedures and does the utmost to support the men and women who have served this country." "We will continue to carefully review partnering organizations to ensure they adhere to all applicable laws, are meeting our expectations, and Veterans are being served appropriately," the department said. U.S. Rep. Henry Waxman, the California Democrat who held the 2008 hearing, told CNN that officials of HHV were using donated funds from "well-meaning Americans" to pay for "high overhead, salaries, golf club memberships and money that basically went into the pockets of people running the organization." "As far as I'm concerned, they ought to be put in jail," said Waxman. But while the State of California is pursuing substantial financial penalties, none of the individuals being sued will face jail time, since the complaint is a civil action. Holbrook made $144,000.00 in a year for working for the Earthquest Institute a mere 15 hours a week, when he wasn't touring Europe of course. No money went to the charibtable endeavors intended. The charity's money lined the pockets of Holbrook and friends. Thanks I might look into this a bit further. 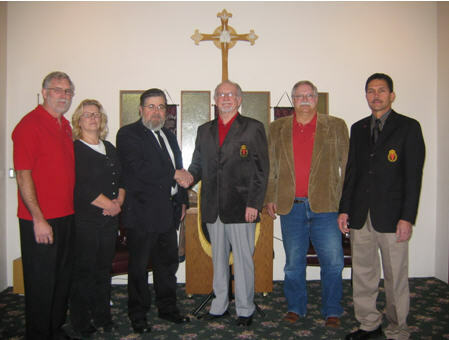 Just a quick look shows these are not knights they are Carey's splinter group who sued the Austrian original group for the right to use the name in the USA. All about the rights and trademarks in the USA. They are like a country club for retired persons of wealth who like badges...ie a moose club....not Templar. The fools are actually registered as supreme not sovereign but forgot this fact about their real name when they paid for advertising via the UN and foolishly registered themselves as the Soverign(in about the mid 70's a fonts splinter group used this tactic to claim they were just knights allied to a country...not god). They were really angry with me then when I pointed out their fearless leader's appointed coat of arms and crest was given by a prince who had been dead for about 8 years when he supposedly signed it....funny trick that. Last edited by consolidation; 08-13-2012 at 11:19 AM. They are like a country club for retired persons of wealth who like badges...ie a moose club. Ah, NOW I get what you're talking about. Looks like they bought a new title in the states to correct their earlier ignorance...and they are an Inc.
Says a lot about them. I have never posted this tidbit before....go down to Carey's iq org....and look at the heading...he admits it's the only one he wrote himself......used to roll laughing for ages on that one. Not very charitable of me. Rear Admiral [Ret.] James J. Carey. Last edited by consolidation; 08-13-2012 at 11:44 AM. Good to see you back posting again,its been a while.I look forward to your input once more on all subjects "templar". Hi Earl Lee, just got back from some volunteer service with a Wik Australian indigenous community in Cape York. Eye opening stuff, but at least I wasn't he only person whose English was rudimentary as they don't use English much either. Going back on a few days so I won't be posting for a while. I will ask a few friends and see if the beaver is up to anything new...hopefully it will be useful to you. This project will only be funded if at least $60,000 is pledged by Sunday Nov 25, 6:22pm EST. Later next year, the Author (me), will lead a modern day pilgrimage to retrace the theoretical history and trail of the Knights Templar across Europe and then to the Holy Land. This will be a guided and all inclusive trip for the most involved and enthusiastic Knights Templar fans. It will coincide with the launch of my new fictional book, "The 9th Templar." I hope you will consider going on this once in a lifetime trip and meeting up with Knights Templar experts and scholars over in Europe and the Holy Land. It will be your opportunity to relive the history of the most exciting group of Knights ever formed, the Knights Templar of Jerusalem. All Templar enthusiasts and modern day members of the order are encouraged to participate in the series of kick-starter projects as they unfold right before your eyes. Veritas vos Liberabit- The Truth Shall Set You Free! The challenge is in getting the project picked up by a traditional publishing house. This can in my opinion be overcome by creating the entire infrastructure as we have laid it out in this project and demonstrating demand for this subject and tying the book to an eventual historical documentary film. Even if the publishing houses do not immediately agree to distribute our project we have experts in the film production and film tax credit industry who can assist us in this matter to find funding for the film production. In addition, the sale of the books over Amazon and Barnes & Noble can still produce adequate revenues and interest to keep the project alive. I believe most of the risks have been properly identified and are offset by our design, production and talented editing team that has been engaged to complete the project. Our current estimate is that with web oriented solicitation the project we will sell by my estimate between 250=500 sales per month of the book. If I add in the cost of a publicist the sales could go considerably higher. In addition the actual Knights Templar Order has over 6000 members and they are a prime target for selling this story as well. The risk of failure in my opinion is minimal if you accept that success if the completion of the printed and video taped elements. What will be the outcome of this project? This project will only be funded if at least $60,000 is pledged by Sunday Nov 25, 6:22pm EST. How Kickstarter works. We all know how Holbrook's projects go. Another "Blue Sky" deal that Holbrook hopes will get him a free grand vacance in Europe next summer. Please join me in reporting this project to Kickstarter. Holbrook's days of lining his pockets with a song need to end!!! Let's keep this project to zero!!! The Knights know he has screwed his creditors to the tune of almost 2 million in a chapter 7 bankruptcy in 2007. He is now in chapter 11 screwing more creditors while hiding from them the fact his kids attend a $35,000.00 a year prep school while he is trying to weasel out of paying his debts. While he was lfoundering in chapter 7 he lived like a king and toured Europe and conned the fine Knights into allowing him to join their order. Holbrook is attacking free speech by suing anyone (including innocent taxpayers) who dared comment on matters of public concern he is involved in. He wants to have free reign with our precious tax dollars. This Black Knight must be stopped!!!! Don Holbrook, is the author of 7 books and a professional public speaker. He has worked in the field of destination entertainment development for major themed attractions for the past seven years as a site location consultant. His background professionally is in the field of economic development. He has many connections within the Hollywood entertainment industry such as award winning Directors, Producers and Screen Writers. He recently finished a fictional novel called " the 9th Templar." His fictional novel was the inspiration for this documentary project regarding what he believed is most likely the theoretical history of what happened to the Knights Templars after 1314. 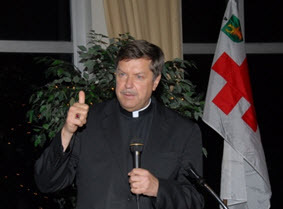 He was invited to join the modern day Knights Templar Order of Jerusalem, (Sovereign Military Order of the Temple of Jerusalem) and was knighted by the order at West Point USMA in June of 2010. He currently is working with several of the knights from the order on the excavation and historical documenting of some newly discovered former Templar Sites in the Holy Land. His entire effort in this area is to produce and publish the Templar Project, which inevitably will include both books, both screen plays, short video trailers, and a short 10 minute film festival video for promotion of the movie concept. He also will be tying this together with his own Templar Ring and Pendant Jewelry collection and a private Templar Winery Reserve production created by the famous Stillman Brown. Over-all Don calls this is Templar Project. "He has worked in the field of destination entertainment development for major themed attractions for the past seven years as a site location consultant." He hasn't got a single themed attraction that has come to fruition or even been financed yet. He has made a fortune in tax dollars for nothing more than consulting work. That is a really sick joke!!! Texas is out $21,000,000.00 in bond money plus $2,500,000.00 more for extravagant travel and meals all over the planet that accomplished nothing. Earthquest will likely never exist on more than paper!! The dirtbag is talking about Hollywood connections now. What a complete joke. If that were so he would have had no trouble getting Earthquest funded. He met Don Lessem and was instrumental in destroying his interactive dino museum dream plans. Holbrook blew that idea up into the failed Earthquest theme park and Lessem I would assume no longer has any association with him. Even with Lessem behind that Earthquest project, Holbrook could not move the thing forward. Holbrook and his "Blue Sky" projects line his pockets very handsomely while the taxpayers and others that invest lose their shirts in the deal and are left to clean up the mess. Holbrook has run around suing and threatening to sue numerous parties he has had dealings with for almost 2 decades now. No one in their right mind would get involved with this clown in any capacity. Now, that his economic development fantasies have come to an end, Holbrook apparently thinks his Knights Templar stories are going to take Hollywood by storm and make him millions. His dishonest dealings and use of bankruptcy to avoid his responsibilities do not coincide with the precepts of the Knights and he must be expelled from that fine organization for their own protection. There is basically no accountability whatsoever for these project creators. Holbrook, who is down and desperate for money, will pay himself whatever is collected claiming that went toward the book and then get his worldwide tour in on backers dime for his historic dig. All he is digging for is cash from dummies. If his book was worth a darn he would have publisher's clamoring for it and wouldn't need suckers to fund it. Anyone who Googles this loser will realize he has a dreadful reputation. He has been dishonest in his business dealings and his professional life has crumbled around him due to all the controversy, his legal threats and his lawsuits against his employers, media, and most shockingly innocent taxpayers that comments on his waste of tax dollars. If he really knew all those Hollywood types and was successful with his 100 plus bragged of projects worth billions of dollars that allegedly created 50,000 jobs, then he wouldn't be on Kickstarter begging for money. Hang on to your pocketbooks and run!!! Only $30,000 of the expected $60,000 paying for your junket ??? The first funds in the project will be to complete the professional full color editing of the coffee table style book, "The Knights Templar Uncloaked." This requires professional editing, production of a book trailer to be placed on the bookstore sites and a screen play adaptation for the documentary including the beat sheet and budget included in the treatment. I've already watched the numerous documentaries on History and Discovery. Why would anyone believe we need to see another one? Seems he's just trying to get monies to move his family out of the country before he really gets caught in his shenanigans. Soapboxmom and EagleOne like this. Seems odd kickstarter web registration is hidden. In Phase 2, we are going to be raising money for the Templar Dig and Excavation in the Holy Land led by Modern day Knights Templar members of the Knights Templar Order. Our discovery will be recorded on film and I will be the official historian on the project. This project is sanctioned and approved by the Government of Israel, Palestinian Authorities and will be also assisted by our colleagues at Hebrew University in Jerusalem. I don't believe for a second any of these parties are dealing with Holbrook directly. Perhaps, the University and officials in Isreal have discussed such work with the Knights proper. The Palestinian Authorities have approved a Christian history project??? I will check all that out and get to the bottom of it. Since our little boneheaded Holbrook is wallowing in bankruptcy yet again, shouldn't he be seeking gainful employment? Shouldn't he be apologizing to the creditors that have been left high and dry while he sent his sons to exclusive prep schools and the whole family toured Europe while they ate all his debt? Is it Christian to conduct business the way Holbrook has??? Liar Holbrook has been editing his page. will be also assisted by our colleagues at Hebrew University in Jerusalem. The University plug has been removed. The dirtbag must have realized his backers and critics might well check out his story with the university and find out it is more Holbrook fiction! I am not buying for a second that the Palestinian authorities have approved this either. Holbrook is digging to be sure. The $hit is piled incredibly deep!